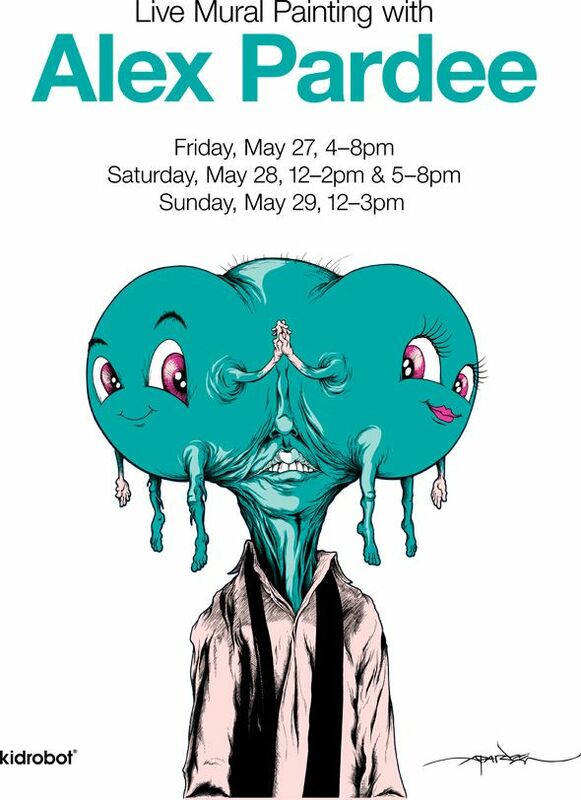 ALEX PARDEE'S LAND OF CONFUSION: KidRobot x Alex Pardee LIVE PAINTING IN VEGAS! By "TOUR" I really mean, about once a week for the next few weeks I'm gonna go hang in different cities and try to sell a few copies of my new book and do fun stuff, like eat and high five bums. For the first stop, to coincide with the release of a movie that has NOTHING in common with my lifestyle (except maybe a beard, a monkey and some general bad decision making), I'm putting on a wolf shirt, ruphie-ing myself, and waking up tomorrow in VEGAS where I'm teaming up with supertoystore KIDROBOT as they take over the Cosmopolitan Hotel on the strip and I am going to be LIVE-PAINTING a huge mural in their new store/gallery all weekend along with signing anything you wanna bring by. If you wanted to even bring by a couple issues of TIME magazine I'd even sign those because it would be funny to be a "sign of the times". Or you can bring those fancy lollipops from across the street so Leah and I can "Sucker-Punch" each other's faces and then high five you if you're a bum. Anyway, come by if you are in or around the Vegas area and watch my back sweat while i nervously try to symmetrically paint a giant friendly monster thing! Upcoming book-releases will be in Portland, Denver, Salt Lake, Oakland and more! Stay tuned! Here is the official press release from KIDROBOT. See you there. NOTE: I'm ONLY going to have about 50 copies of my book on hand, but I'll be painting all weekend. Word. "The amazing Alex Pardee will be throwing down his brilliant brush work on a Kidrobot inspired mural for 3 days at The Cosmopolitan Hotel in Las Vegas this weekend. The creative juices start flowing tomorrow Friday, May 27 from 4-8 pm. Alex will continue this monstrous painting on Saturday, May 28 from 12 -3 pm and 5-8 pm. He will then apply the finishing touches on Sunday, May 29 from 12-3 pm. 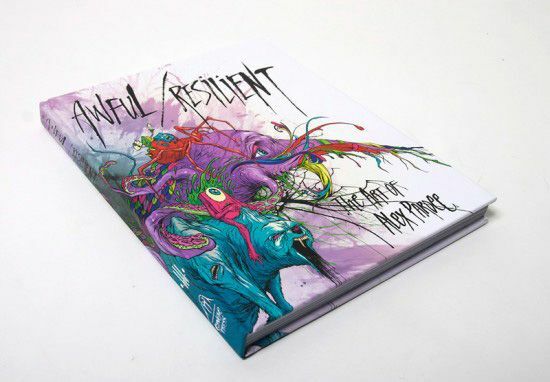 Alex will also have on hand his new 172 page hardcover book Awful / Resilient which features 250 of his illustrations and photos. So swing by and get yours signed and watch a modern master in his element."